﻿Has ﻿your ﻿septic ﻿cover ﻿gotten ﻿buried? ﻿You ﻿can ﻿extend ﻿the ﻿septic ﻿pipe ﻿so ﻿your ﻿lid ﻿can ﻿be ﻿easily ﻿accessed ﻿the ﻿next ﻿time ﻿the ﻿pumper ﻿truck ﻿comes ﻿around. ﻿I ﻿am ﻿so ﻿glad ﻿we ﻿did ﻿this. ﻿My ﻿video ﻿shows ﻿exactly ﻿how ﻿a ﻿pro ﻿adds ﻿a ﻿septic ﻿tank ﻿riser ﻿and ﻿a ﻿cover. ﻿These ﻿lids ﻿aren't ﻿sold ﻿at ﻿your ﻿local ﻿building ﻿supply ﻿stores. ﻿So ﻿where ﻿the ﻿heck ﻿can ﻿you ﻿find ﻿one? 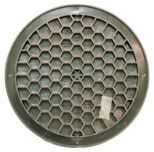 ﻿The ﻿Jackel ﻿company ﻿sells ﻿septic ﻿covers. ﻿Go ﻿measure ﻿yours ﻿before ﻿ordering! ﻿They ﻿come ﻿in ﻿24”, ﻿18” ﻿and ﻿12” ﻿sizes. ﻿It's ﻿made ﻿of ﻿high ﻿strength ﻿plastic ﻿and ﻿is ﻿lightweight. ﻿The ﻿lid ﻿can ﻿handle ﻿up ﻿to ﻿2,500 ﻿pounds. ﻿The ﻿textured ﻿“Lawn ﻿Deco” ﻿decorative ﻿surface ﻿is ﻿non-slip. ﻿Square-drive ﻿stainless ﻿steel ﻿screws ﻿(no ﻿rust) ﻿are ﻿used ﻿for ﻿attaching ﻿to ﻿the ﻿riser. ﻿Where ﻿to ﻿buy ﻿a ﻿septic ﻿lid, ﻿riser, ﻿etc. ﻿Click ﻿here ﻿to ﻿buy ﻿the ﻿24" ﻿septic ﻿cover ﻿on ﻿Amazon. ﻿Here ﻿is ﻿the ﻿18” ﻿septic ﻿cover. ﻿And ﻿here ﻿is ﻿the ﻿12” ﻿septic ﻿cover. ﻿Sometimes ﻿the ﻿links ﻿change, ﻿click ﻿here ﻿to ﻿do ﻿a ﻿search ﻿of ﻿Amazon ﻿for ﻿“Jackel ﻿Septic ﻿Tank ﻿Riser ﻿Cover” ﻿and ﻿you’ll ﻿see ﻿a ﻿nice ﻿list. ﻿The ﻿photo ﻿of ﻿the ﻿lid ﻿on ﻿Amazon ﻿looks ﻿exactly ﻿like ﻿the ﻿ones ﻿my ﻿septic ﻿professional ﻿installed ﻿except ﻿it ﻿appears ﻿to ﻿be ﻿a ﻿different ﻿shade ﻿of ﻿green. ﻿Compare ﻿the ﻿pictures ﻿for ﻿yourself. ﻿I ﻿am ﻿just ﻿trying ﻿to ﻿help ﻿locate ﻿these ﻿supplies ﻿for ﻿whoever ﻿wants ﻿to ﻿do ﻿this ﻿themselves. ﻿I ﻿don't ﻿make ﻿or ﻿sell ﻿them. ﻿I ﻿just ﻿filmed ﻿my ﻿septic ﻿pro ﻿installing ﻿them. ﻿You ﻿might ﻿be ﻿able ﻿to ﻿buy ﻿parts ﻿from ﻿a ﻿local ﻿septic ﻿guy ﻿or ﻿ask ﻿him ﻿where ﻿he ﻿buys ﻿his. ﻿I ﻿find ﻿septic ﻿guys ﻿to ﻿be ﻿very ﻿friendly ﻿and ﻿un-appreciated. ﻿We'd ﻿be ﻿up ﻿sh*t ﻿creek ﻿without ﻿them. ﻿The ﻿dual ﻿wall ﻿riser ﻿pipe ﻿the ﻿septic ﻿fellow ﻿used ﻿in ﻿the ﻿video ﻿can ﻿be ﻿found ﻿at ﻿building ﻿supply ﻿stores, ﻿but ﻿you ﻿might ﻿have ﻿to ﻿hunt ﻿around ﻿to ﻿find ﻿one ﻿that ﻿carries ﻿24". ﻿You ﻿can ﻿Google ﻿“24-in ﻿Corrugated ﻿Culvert ﻿Pipe” ﻿ ﻿but ﻿it ﻿comes ﻿in ﻿20 ﻿foot ﻿sections. ﻿Probably ﻿more ﻿than ﻿you ﻿need. ﻿And ﻿it’s ﻿crazy ﻿expensive. ﻿That's ﻿why ﻿calling ﻿your ﻿local ﻿septic ﻿guy ﻿and ﻿asking ﻿him ﻿if ﻿he ﻿has ﻿some ﻿to ﻿sell ﻿might ﻿be ﻿cheaper ﻿to ﻿buy ﻿and ﻿easier ﻿to ﻿tote ﻿home. ﻿They ﻿might ﻿need ﻿$20 ﻿or ﻿$30 ﻿per ﻿foot ﻿of ﻿pipe ﻿or ﻿they ﻿might ﻿just ﻿give ﻿you ﻿some ﻿if ﻿you ﻿give ﻿them ﻿your ﻿future ﻿clean-out ﻿business. ﻿The ﻿sealing ﻿foam ﻿used ﻿in ﻿the ﻿video ﻿is ﻿called ﻿Great ﻿Stuff ﻿Foam. ﻿Last ﻿time ﻿I ﻿looked ﻿it ﻿was ﻿under ﻿$9 ﻿at ﻿Amazon ﻿(Prime ﻿free ﻿shipping. ﻿#10 ﻿x ﻿2 ﻿1/2" ﻿screws ﻿to ﻿connect ﻿the ﻿riser ﻿are ﻿available ﻿here. ﻿A ﻿company ﻿called ﻿TUF-Tite ﻿has ﻿a ﻿system ﻿of ﻿interlocking ﻿covers ﻿and ﻿risers. ﻿There ﻿are ﻿risers ﻿6” ﻿or ﻿12” ﻿high ﻿available ﻿in ﻿12”, ﻿16”, ﻿20” ﻿and ﻿24” ﻿diameters. ﻿Another ﻿company ﻿called ﻿Polylok ﻿has ﻿a ﻿similar ﻿system ﻿of ﻿parts, ﻿too. ﻿Here ﻿is ﻿their ﻿catalog. How to extend the riser and lid/cover of your septic tank! ﻿Here ﻿is ﻿the ﻿cover ﻿that ﻿was ﻿installed ﻿on ﻿my ﻿septic ﻿riser. ﻿You ﻿can ﻿see ﻿the ﻿design ﻿matches ﻿the ﻿covers ﻿I ﻿link ﻿to ﻿on ﻿Amazon.